Evodia fruit (Wuzhuyu)-Evodia rutaecarpa (Juss.) Benth. Part Used & Method for Pharmaceutical Preparations: The fruit is gathered in August or November and dried in the sun. It is then soaked in the decoction of Licorice root (Gancao). 1. Cold attacking the spleen and stomach manifested as epigastric and abdominal cold pain. Evodia fruit (Wuzhuyu) is used with Dried ginger (Ganjiang) and Costus root (Muxiang). 2. Cold stagnation in the liver meridians manifested as hernia. Evodia fruit (Wuzhuyu) is used with Fennel fruit (Xiaohuixiang) and Lindera root (Wuyao). 3. Weakness of spleen and stomach, and liver qi rising upward manifested as headache and vomiting. 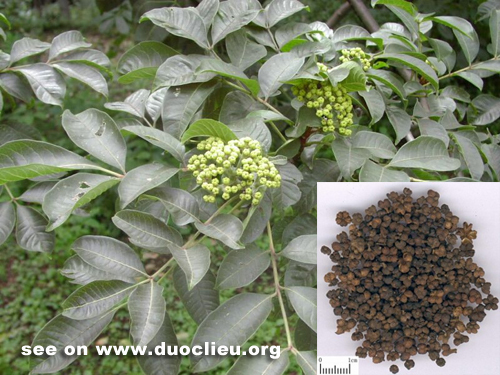 Evodia fruit (Wuzhuyu) is used with Ginseng (Renshen) and Fresh ginger (Shengjiang) in the formula Wuzhuyu Tang. 4. Deficiency and cold of the spleen and kidneys manifested as chronic diarrhea. Evodia fruit (Wuzhuyu) is used with Schisandra fruit (Wuweizi) and Nutmeg (Roudoukou) in the formula Sishen Wan. 5. Beriberi. Evodia fruit (Wuzhuyu) is used with Chaenomeles fruit (Mugua) for external application. 6. Vomiting and acid regurgitation: a) cold in the stomachEvodia fruit (Wuzhuyu) is used with Fresh ginger (Shengjiang) and Pinellia tuber (Banxia); b) fire transformed from prolonged liver qi stagnationEvodia fruit (Wuzhuyu) is used with Coptis root (Huanglian) in the formula Zuojin Wan.